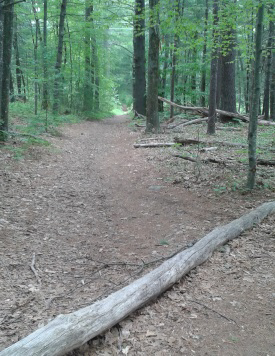 Hanover is a town located in the part of the south shore hiking trails that I refer to as the middle eastern sector. Most of the south shore is accessed by route 3. This route runs through the northern part of Hanover. Routes 53 (off the route 3 exit), 123 and 139 are some of the other major routes in this town. to traverse most of the town north to south. While Broadway runs across most of the southern portion of town. It starts at the "Four Corners" historic portion of Hanover where the town was first settled. 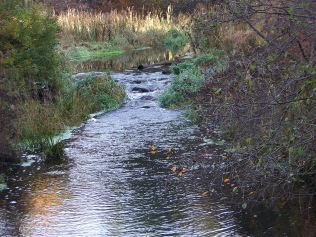 One of it's natural features is the North River. This not only serves as a natural boundary line on it's southern side but helped shape the town's history. of the early history of Hanover can be seen. The town uses a simplified version of the original design. ship building and later iron forges that built the anchors for those ships. Hanover was first settled in 1649 as part of the town of Scituate. The first settler was William Barstow, a farmer who built a bridge across the North River giving access to the land that became Hanover. Like many of the other towns that were settled here on the south shore, Hanover's first industries were farming and saw and grist milling. The lumber from the saw mills was used to build houses and in shipbuilding. The North River made Hanover a convenient place for ship building of that era. Eventually the ships were built larger and the river could no longer accommodate them. 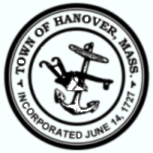 Once that happened the town of Hanover adapted for this change and turned to forging iron to anchor those ships. It is said that the anchors for the U.S.S Constitution were forged here at a company called Anchor Works. The original town seal design backs this information up as the tag on the anchor reads Old Ironsides as the USS Constitution was nicknamed. The location of that business was at Luddam's Ford (Elm St) on the Indian Head River, a tributary of the North River. 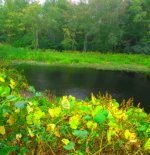 This location receives it's name from James Luddam, who as a guide to the area, forded the river with the then governor of Massachusetts Bay Colony John Winthrop on his back. This was in 1632, years before the bridge was built. After the town was settled the area grew and many other settlements established. 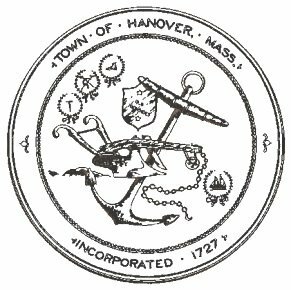 Hanover became a self reliant community and incorporated itself in 1727. Other noteworthy industries in the town were a tack factory (the invention of a tack making machine was invented in Hanover), shoe making industry, the National Fireworks Inc (fireworks and munitions for the 2nd world war), Clapp rubber company and a small airport (Clark airport). A large part of trail development in Hanover is the Greenway Project. This is Hanover's on going project to develop a town wide network of trails. Envisioned by the Open Space Committee, it was initiated in 1999 with a three phase plan. Much of the original planning has come to fruition. The original planning document claims there are 1760 acres in Hanover available for public recreation. The problem at the time was that these each stood alone and their potential had not been realized. It is this greenway project that intends to link these properties together. Currently most of the action points of the original planning have been implemented. 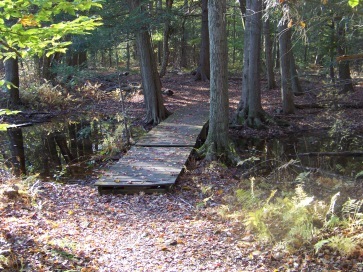 There are only a few items that remain and once the work is finished it is estimated that there will be approximately 10 miles of continuous hiking trails in Hanover. 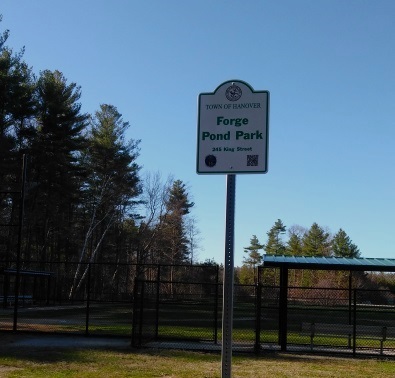 Some of the newest trail developments are the signs placed at trail heads and the development of the former Cervelli Cornfields into the Forge Pond Park. This park is somewhat of a hub to many of the trails. There are several parking lots, a variety of playing fields complete with paved walking around the outer boundary of the property. Another good feature is the abundance of trash receptacles. 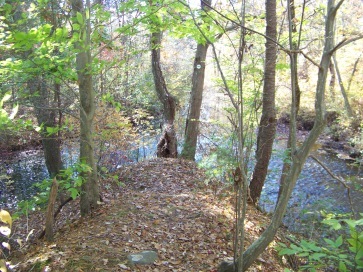 A small picturesque trail that runs along the side of Forge Pond. At it's end it connects to French's Stream Trail. This trail can also be found on Circuit St at the intersection of Summer St. Plenty of parking. 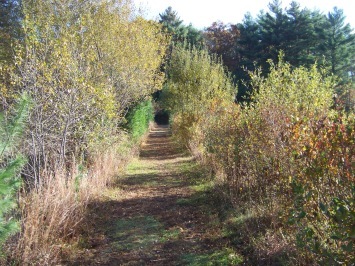 This is the start of a connection of many of the greenway hiking trails in Hanover. This area sits to the right side of Forge Pond Park. A quick loop around a former cranberry bog. Great for bird watching and not too long for small children! 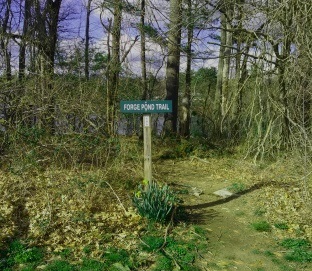 Located across from the Forge Pond Park, this trail is a bit lengthy with much scenery and possible wildlife sightings. 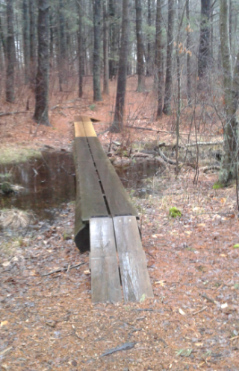 Runs along and over Drinkwater River and crosses over Factory Pond to make a full loop trail. The beginning of the Hanover Greenway. Designated as cross country ski trails leading through the forest behind several of the schools in the area. This hiking trail winds it's way through the forest over several little bridges along the Drinkwater River with it's intersection with the Longwater Brook. 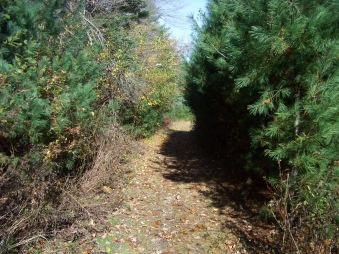 This trail is located on Pleasant St. 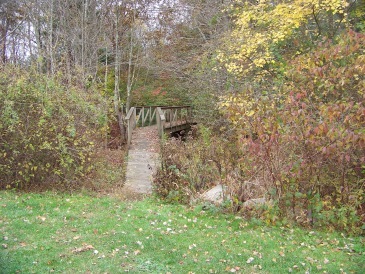 It sits close to the Rockland town line and can be used to access the Rail Trail. This is part of the greenway but isolated by a portion that has not been developed yet. A mostly wide cart trail with a connecting network of trails that showcase the Indian Head River. The trail connects to Luddams Ford Park and it's hiking trails. There's a new group in town called Hanover Trail Watch! You can get involved or just find trail maps to all the trails in town.